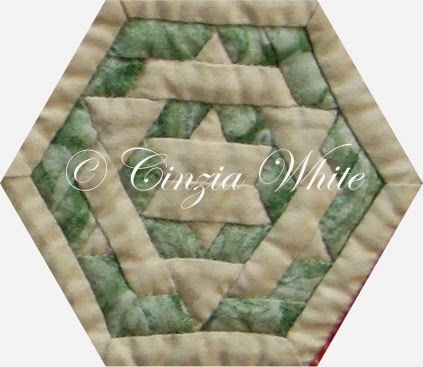 Time for the next block of the month and for those people who enjoy hand work this is a perfect one for you. Kew Gardens needs a bit of care when placing the pieces but if you follow the step by step diagrams it should be a piece of cake.... albeit a small one. Oh and the block is straight. The camera wasn't! 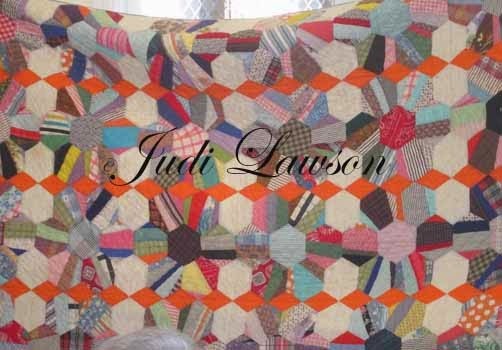 There is no greater thrill I think than seeing a quilt made by someone you don't know of a pattern you wrote and so I was really pleased when Jennie sent me this photo of her quilt. 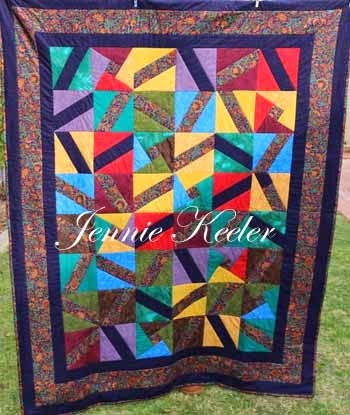 The pattern, Terri's Treats, was published a few years ago in Australian Patchwork and Quilting. My colours were nowhere near as bright as Jennie's and her border in particular is superb, don't you agree? 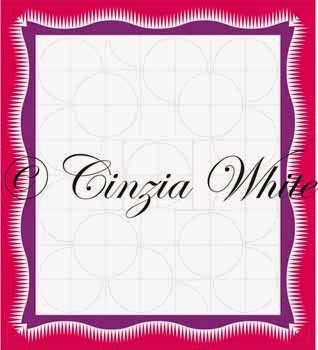 Well the designing continues, thankfully it is only a draw and colour exercise at this stage as this is the best out of about nine borders I have drawn up so far. Boy am I glad I did that class with Robbi Eclow as the skills she taught me about designing with Illustrator have been invaluable. Although I think the edges look great I'm not keen at all on the corners so I suppose it is as they say back to the drawing board. 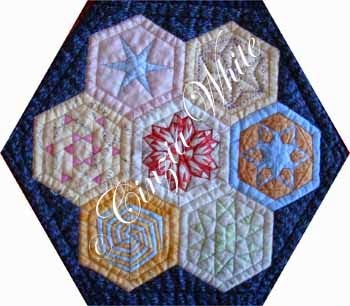 Well I know it has been ages since I posted a photo of my hexagon quilt but here it is. I am yet to attach the triangular sections but you can see it is moving along. 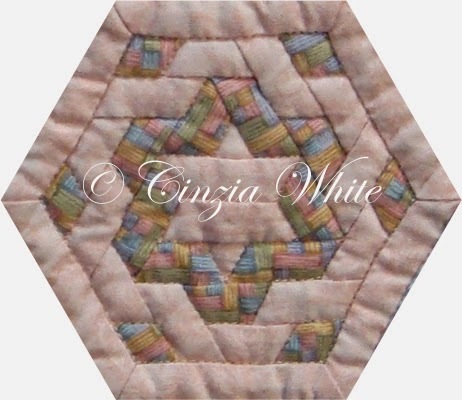 Should be ready for the NSW Quilt Show in Sydney ... 2016 that is. I have never been one to rush things and no point changing a system that works. Well isn't this a great block? 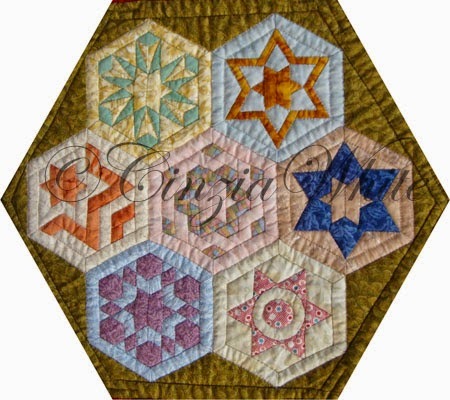 You can tell that Carol is still into the hexagons and EPP. You would have thought she'd had enough of both having finished making Raconteur! 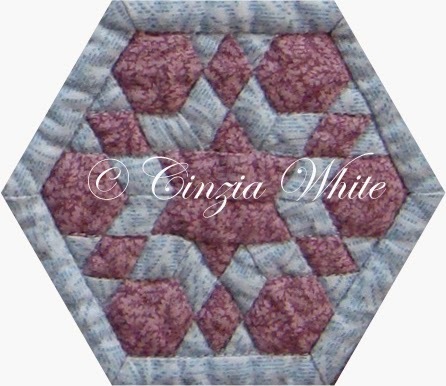 This is her block from Quiltmaker's 100 blocks. Isn't it great and of course she still insists on using those great prints. I just love how the star in the middle stands out. 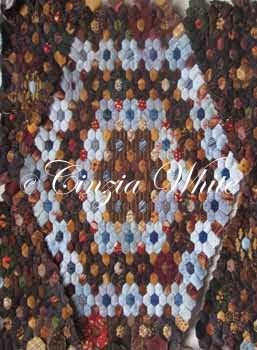 Oh in case you haven't already done it slip on over to here and enter Quiltmaker's competition you could win your own copy of the latest edition of 100 blocks or you may even win one of the other great prizes. These competitions are open to everyone world wide. Well today is the day. Quiltmakers 100 Blocks Volume 11 blog tour begins here. 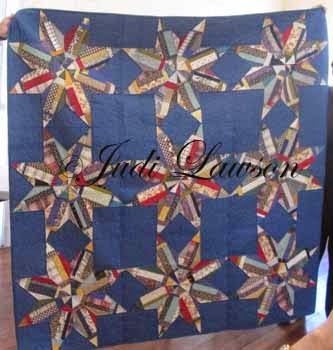 This is my block Tall Ships which developed from my Raconteur - The Storyteller's Collection quilt. Isn't it amazing the difference made with different colour/value selection. All that I have done is reverse the darks and the lights and the block looks fantastic now ... says she with a totally biased opinion. Don't you love the starburst in the middle of the block .. it is so much more alive now? 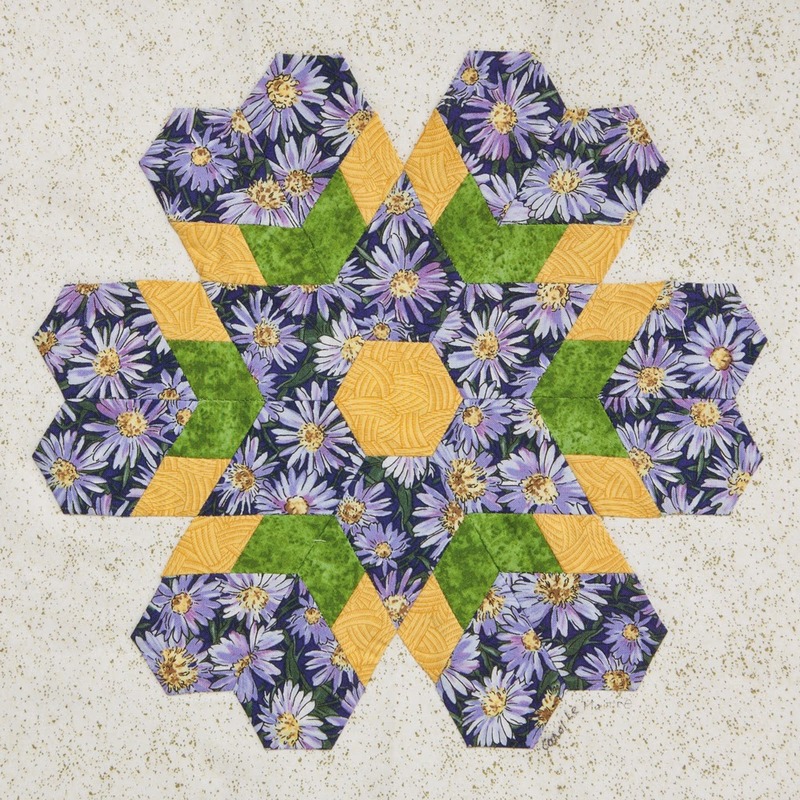 The original quilt was started in 2012 and consists of 363 miniature hexagonal blocks. 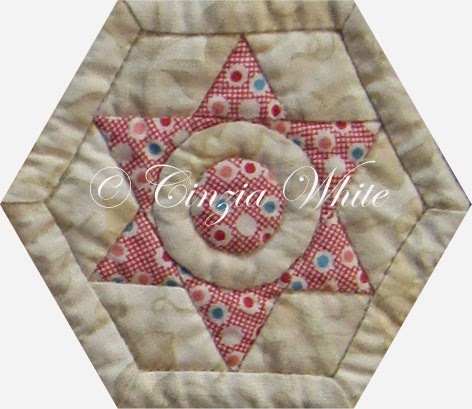 I have been able to design many new quilts and blocks from that treasure trove. 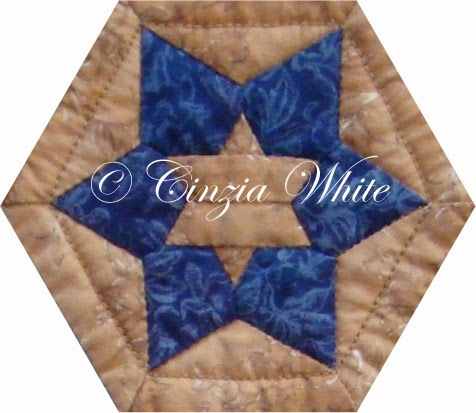 One thing I discovered making this block for Quiltmaker is that when you make something bigger it is a lot easier. 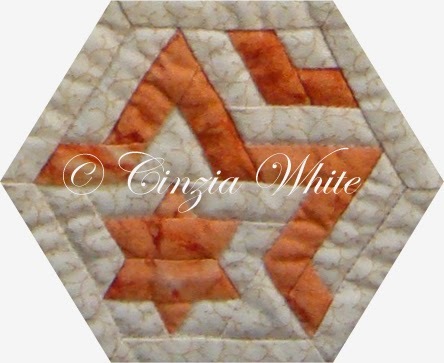 The original block was 2 1/4in ... including the border. 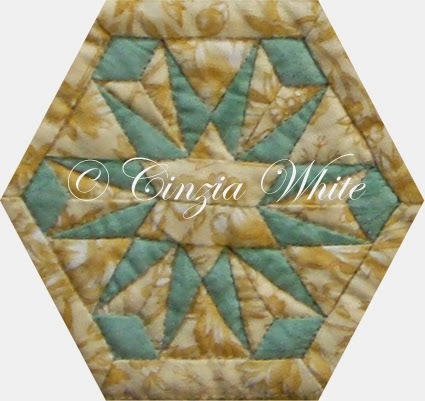 Quiltmaker blocks are 12in. That makes it a lot easier. 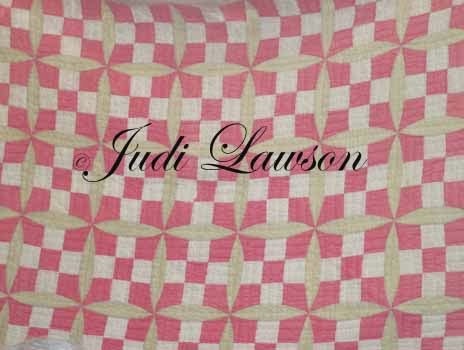 In fact the Quiltmaker block took only a bit over an hour to make, whereas the Raconteur block took several hours. Today is my wedding anniversary ... what a coincidence. 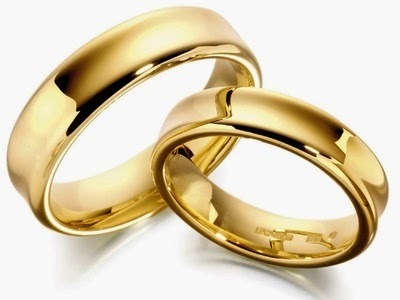 Paul and I have been married for thirty wonderful years. 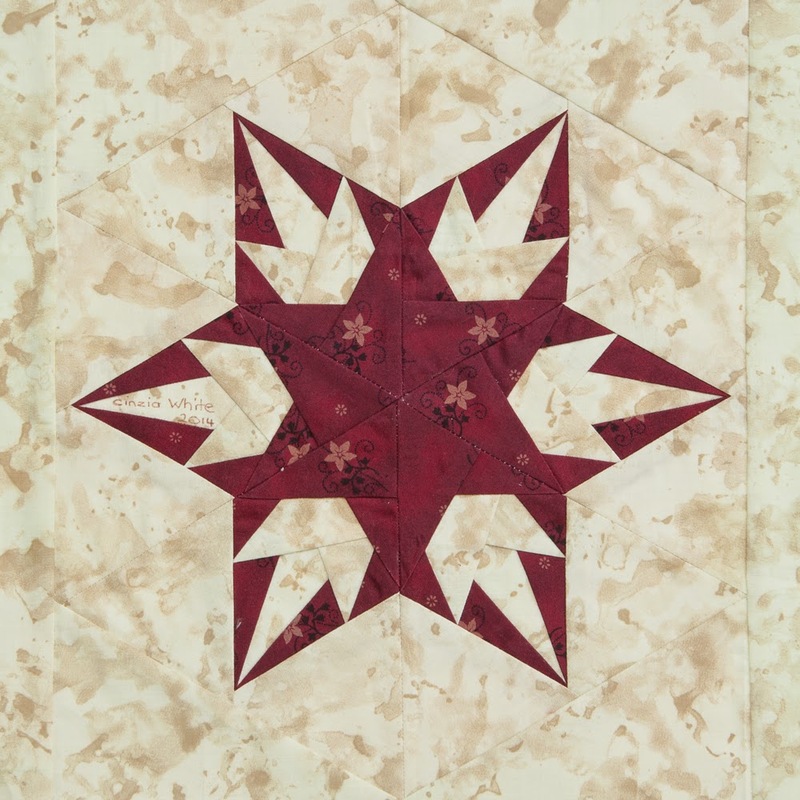 If you would like to have a chance to win your own copy of the latest issue of Quiltmaker's 100 Blocks simply leave your name and the year that you found someone special in the comments below. Make certain that there is a link to your email addy or there is some way that I am able to contact you as anonymous entries cannot win. Good luck. 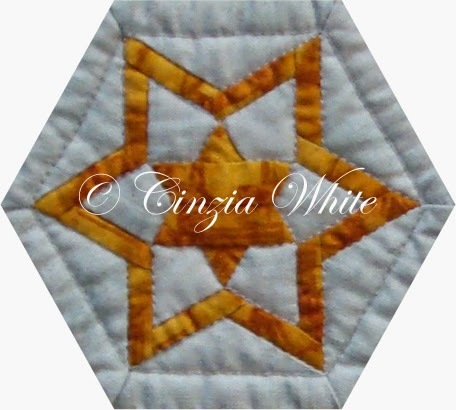 After leaving your name check back to Quilty Pleasures for links to other blogs where you may win. Luca was a young girl that brightened everyone's day whenever she crossed one's path. Absolutely no idea where South Street is nor what is so great about number 16 but it seemed like the perfect name when I thought of it. The Statue of Liberty has influenced many designs since its construction and this is yet another.